LOS ANGELES, CA--(Marketwired - January 24, 2017) - In celebration of the 25th anniversary of the iconic comedy classic Wayne's World, SpectiCast and Paramount Pictures are hosting a most excellent, two-night, theatrical event on February 7th and 8th, 2017. Fans across the U.S. will have the chance to party on with Wayne and Garth when the film returns to more than 400 theaters. The special events will include an exclusive introduction by Peter Travers (Rolling Stone Magazine and ABC-TV) and a videotaped chat with the director and cast members after the film. Wayne's World was originally released on February 14, 1992. In addition to the film making its way back to theaters, Wayne's World events will be taking over Aurora, IL, and Los Angeles, CA. Aurora (the film's setting), will be celebrating all over the city with over a dozen events happening from early February until July. Plans include a special advance screening for one night on February 3rd with an appearance by Tia Carrere. Other fun includes: look-alike contest, an air guitar competition, poster contests, giveaways and much more. Learn more about what is happening in Aurora, here & here. 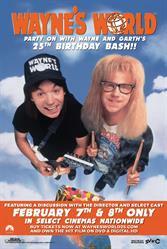 ADVANCE NATIONWIDE ANNIVERSARY SCREENING: Party On With Wayne and Garth in their Hometown Area For One Night Only. Friday, February 3rd, 2017 at 6:30pm cst. Hollywood Boulevard Cinema, 1001 W 75th St., Woodridge, IL 630-427-1880. Tickets Available HERE. In Los Angeles this weekend, (January 27th - January 29th), Entertainment Weekly and Sports Illustrated are partnering for special Wayne's World events taking place during NHL All Star Weekend sponsored by Honda. The film will be showing at the LA Convention Center and fans can spend time at Stan Mikita's Donuts, which will be specially reconstructed for this event. 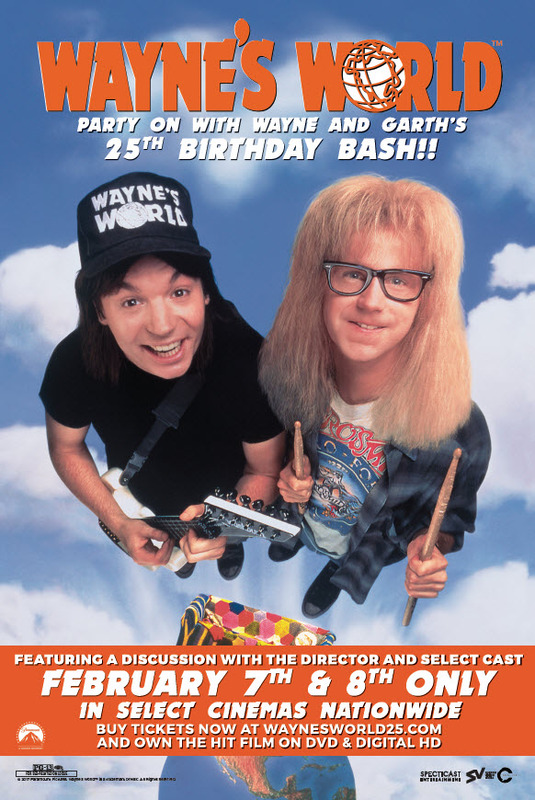 Based on the "Saturday Night Live" sketch of the same name, Wayne's World is a wacky, irreverent pop-culture comedy about the adventures of two amiably aimless metal-head friends, Wayne (Mike Myers) and Garth (Dana Carvey). From Wayne's basement, the pair broadcast a talk-show called "Wayne's World" on local public access television. Wayne's World, directed by Penelope Spheeris, grossed $183 million in its theatrical run, placing it as the tenth highest-grossing film of 1992 and the highest-grossing of the 11 films based on "Saturday Night Live" skits. The movie features Rob Lowe, Tia Carrere, Lara Flynn Boyle, Brian Doyle-Murray, Robert Patrick, Chris Farley, Ed O'Neill, Ione Skye, Meat Loaf, and Alice Cooper. "Wayne's World transcends generations to pay tribute to an indelible place in American pop culture," says SpectiCast CEO Mark Rupp. Peter Travers of Rolling Stone Magazine adds, "Director Penelope Spheeris brings out the best in Mike Myers and Dana Carvey while converting a classic SNL sketch into an enduring, full bodied film for the ages." Paramount Home Media Distribution also will celebrate the anniversary with a Wayne's World Double Feature on DVD and Digital HD, arriving February 14, 2017. Plus, Wayne's World will be available on iTunes with new-to-digital extras, including a Director's Commentary and Making-Of featurette. SpectiCast is one of the fastest growing producers, financiers, distributors and marketers of Event Cinema worldwide. We have distributed over 400 event cinema releases to screens around the globe and have brought original world class programming to audiences on over four thousand screens in 65 countries. We have distributed programs from some of the world's most prestigious cultural arts organizations and leading entertainment companies including the Opera de Paris, The Vatican Museums, The Royal Albert Hall, The Salzburg Festival, The Paris Opera Ballet, the Mariinsky Theatre, the British Museum, the Philadelphia Orchestra, Universal Music, Sony Music, Paramount, Warner Bros., Trancas International, and EagleRock Entertainment -- featuring works by Shakespeare and Shaw, Beethoven and Bach, da Vinci and Dalì, Sondheim and Satriani -- with performances by Mikhail Baryshnikov, Renée Fleming, Christopher Plummer, Paul McCartney, Drake, Aerosmith and The Rolling Stones just to name a few. SpectiCast provides content rights holders with turnkey access to worldwide theatrical distribution as well as all downstream digital distribution platforms including DVD, VOD and TV. We also provide a wide range of logistical and digital media services including feature and short mastering, trafficking and logistical support, Encryption/KDM management and quality control service. SpectiCast is a privately owned and operated firm based in Philadelphia, PA. We also maintain offices in Pittsburgh, PA, Mexico City, MX and London UK. Paramount Home Media Distribution (PHMD) is part of Paramount Pictures Corporation (PPC), a global producer and distributor of filmed entertainment. PPC is a unit of Viacom (NASDAQ: VIAB) (NASDAQ: VIA), home to premier media brands that create television programs, motion pictures, consumer products, and digital content for audiences in 180 countries and territories. The PHMD division oversees PPC's home entertainment and transactional digital distribution activities worldwide. The division is responsible for the sales, marketing and distribution of home entertainment content on behalf of Paramount Pictures, Paramount Animation, Paramount Vantage, Paramount Classics, MTV, Nickelodeon, Comedy Central and CBS and applicable licensing and servicing of certain DreamWorks Animation titles. PHMD additionally manages global licensing of studio content and transactional distribution across worldwide digital distribution platforms including online, mobile and portable devices and emerging technologies.